When I mentioned in Wabi-Sabi Love that I collect tin cans, I was only partially joking. 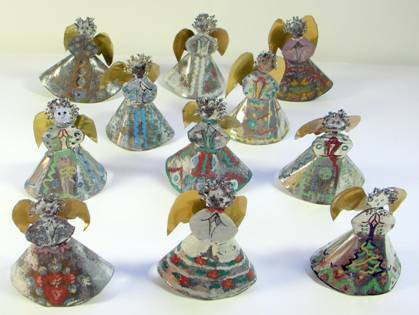 In fact, I have a heavenly host of angels fashioned from tin cans. Now, seven decades after their creation, most are beginning to resemble their origins as containers for soup, green beans, and the like. 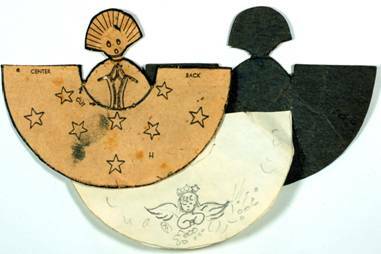 Originally fashioned from a simple pattern taken from a 1945 newspaper, they consist of two simple pieces – body and wings. (Interestingly, some things never change. The copy on the reverse includes daily horoscopes, an article on how to avoid a person who is a pest, and sadly, instructions on how to donate to an orphanage, an all too common situation during and after WWII.) Where did I find these angels? They were handmade by my mother, during an era when many things were still rationed – sugar, coffee, cheese, canned milk, cars, bicycles, typewriters, gasoline, etc. In addition, her parents followed the adage adopted during the Great Depression – “Use it Up, Wear it Out, Make it Do, or Do Without” and their daughter followed suit. In the front row, we have a Valentine Angel, a Christmas Angel and a Choir Girl. I’m particularly fond of this pink themed little lady complete with spring trees in blossom and a swag of tassels at her hem. She reminds me of a Scandinavian design. I also have to admit that the hair and wide-eyed facial features evoke memories of Little Orphan Annie! “It was always fun when we could get the circles in the bottom of the can to work just right in the wings” she explained, as happened here. This all took place years before I came along, but they were lovingly saved and made an occasional appearance around the crèche when I was a very young child. Gradually, they were replaced with more sophisticated decorations, until finally, they were not brought out at all. Admittedly, we loved the glass birds, beads and baubles that replaced them, but for me, these still pass the ‘fire test.’ i.e. If the house were on fire and you could grab only one box of ornaments, which would it be? I’m sure for many of us, we’d bypass the Christopher Radko (although lovely) for anything handmade. So there you have it, another Accidental Collection that would mean nothing to anyone but the collector, but to this collector means the world. 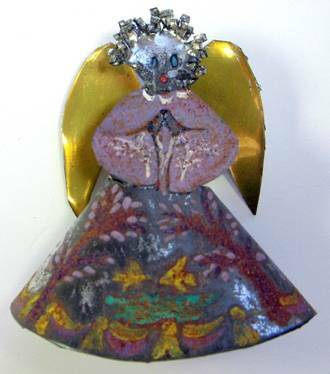 Mom tried out a few images on paper which I never saw executed, like the pencil drawing of this tiny praying angel adorned with a halo of stars. I also found her cardboard master, which explains why the newspaper pattern survived. Also brings to mind an event that happened when my parents were forced to evacuate their home, when it was threatened by forest fire in the woodland hillsides of Big Sur. If you’ve ever seen a canyon fire, it’s astounding to watch an entire hillside explode into flames. During one withdrawal, dad had the Blazer loaded – paintings, important papers, beloved dogs, etc. This was long before the cloud provided storage for photos and documents. Mom was in the basement in tears, frantically searching through a storage trunk while dad waited impatiently with the motor running. He assured her nothing could be that important. He offered to help, but she declined. Finally…Eureka! She emerged with the treasured envelope, but refused to discuss her rescued prize during the long drive to town. No wonder. She knew he’d be upset to discover the delay had been for – our grade school Report Cards!! A few had straight A’s and apparently she knew no one would ever believe it without tangible proof. Thereafter they were kept in a chest near the front door, along with cherished baby pictures, available for quick getaways. 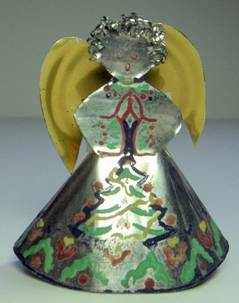 My guess is these tin angels were saved, obviously not for their value, but for the memories of a time when a young newlywed was happy and content to make do with whatever was at hand. Do you have a ‘fire test’ treasure? We’d love to hear your story. What an amazing story about those beloved angels. They are treasures! Really loved the stories about the tin angels !!! Makes me miss Bobbie !!! Love these homemade gems!!! A real treasure.